We have Just Sold out of Star Wars Series 1 Mymoji Mini-Figure Display Case. Not to Worry! Fill in the Notify me When Available and you will be the first in line for our restock of Star Wars Series 1 Mymoji Mini-Figure Display Case !! From the Star Wars collection by Funko. Star Wars Series 1 Mymoji Mini-Figure Display Case. Your favorite characters as 1.5 inch emoji mini-figures. Case contains 24 blind-bagged Mymoji mini-figures. Item selection is random. Items are in blind packaging. We cannot accept requests for specific items nor can we accept returns on opened items. You may receive duplicates. 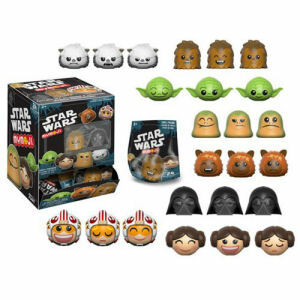 Funko Star Wars Figurines shipping from Canada. No Surprise Border fees or Customs!